Skin Care wipes... The dirty little secret of my suitcase. I thought I knew all about the terrible effects they can have on your skin, but yet there always seemed to be a packet in my basket every time I visited the drug store. I have them mainly - like im sure many of us do - for convenience. There's nothing like laying in bed and whipping a wipe around your face whilst glued to Netflix. It's the epitome of lazy skincare, and it feels amazing. But is this conveniently fast skincare staple playing havoc with our skin? I'm lucky enough to have fairly good skin (thanks mum!) but somewhere inbetween flying in a dehydrated metal tube so often and being on the grimey London Underground, my skin has reached out and asked me for some extra TLC. 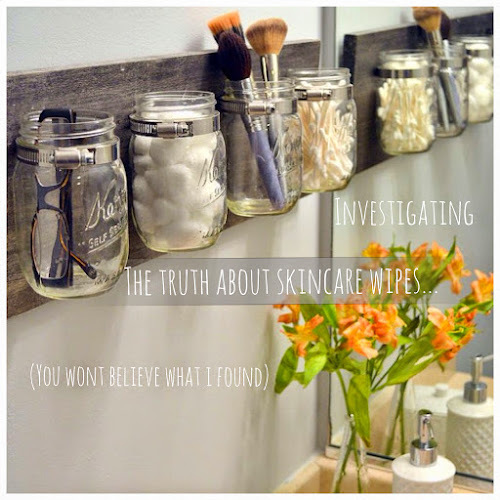 With virtually every skincare brand out there selling their own variety of 'face wipe' - some even claiming that in one wipe you can achieve a full 3-step skincare regime of cleansing toning and moisturising (erm, highly doubtful) - it's easy to see how you could rely on them without really knowing the harm that's being caused. I decided to do a little research on face wipes and see for myself if the bad wrap they get is justified... This is what I found. How can they be so bad? Firstly, being packed together tightly and spending a long time on warm shop floors basically makes them a breeding ground for bacteria. To try to overcome this, and to extend their shelf life, they are packed with nasty preservatives. Alcohol and anti-bac agents are added to keep them fresh resulting in a shelf life of over 18 months in most cases. A recipe for a sensitive skin disaster. So what's inside an average skincare wipe? Some of the ingredients found in many leading skin care wipes are controversial to say the least, including Bromo-Nitropropane-1 (a highly hazardous anti microbial agent that is risky to use on the skin) Parabans, and irritants such as Propylene/Dipropylene glycol (more Irritants).... If you are going to use face wipes occasionally for convenience, have a quick check first to make sure you choose some without these nasty ingredients. Then there is the issue of actually removing make-up and daily grime from your face in this way, because a skin care wipe doesnt actually remove everything. Ever tried a second or third wipe, only to keep seeing more mascara crap appear as if from nowhere? Try cleansing after using a skincare wipe and see how much make up comes off on the cotton wool, it's not pretty. Lastly, remember when using skincare wipes that your essentially laying the foundation for your serum, moisturiser, or any other products you like to finish off with before you sleep. What's the point in spending money on a fancy face cream if your layering it over such poorly cleansed skin? With dirt and leftover makeup undetectable, applying a mousituser after using a skincare wipe is a recipe for a nasty breakout. What are your thoughts on facial wipes? Let's chat in the comments! I would love to stop using them but honestly, nothing removes my make-up the same. I find eye removers give me eczema from rubbing away the mascara. I'm trying to prize my daughter away from using them but they're just so convenient for her especially when lying in bed watching Netflix!! Her skin is going through a bad phase at the moment and I've told her they certainly are not helping matters!!! I will keep on at her! Great post, Mimi! I stayed clear from wipes after hearing Caroline Hirons go on about them and doing my own research. My skin has thanked me a lot.